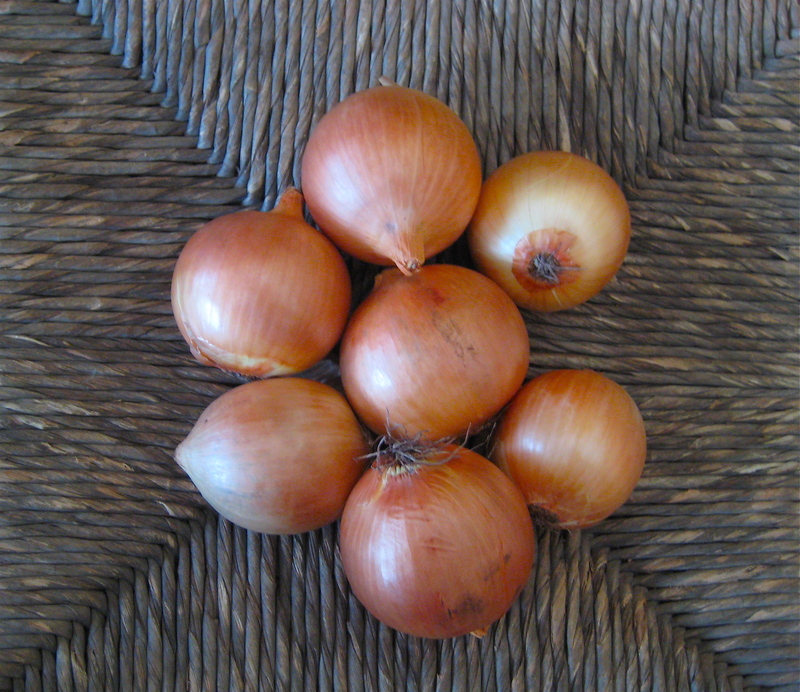 SCRATCH SUPPER: SPAGHETTI WITH MELLOW-YELLOW ONIONS | Jane Lear. Writing on Food and Travel. Italians have an uncanny knack for making something out of nothing, for making something that is simultaneously minimalist—austere, even—and luxurious. Think of the interiors, the clothes, the jewelry, in last year’s film I Am Love. In an Italian kitchen, this trick relies, in part, on impeccable ingredients that aren’t fussed over too much. But, more importantly, it relies on the fact that no ingredient is ever taken for granted. A terrific example of this is spaghetti with onions, which has been one of my scratch suppers for years. I wish I could remember who gave me the idea, but I don’t have a clue. A rummage through the bookshelves turned up a number of similar recipes with caramelized onions, which variously involve homemade pasta, garlic, chicken broth, heavy cream, dry white wine, freshly grated Parmigiano-Reggiano, and/or white pepper. I’m sure they are lovely, but they’re not at all what I want. What I am talking about is staggeringly simple to prepare and good any time of year. My husband and I especially enjoy having it for a late-ish Sunday supper after being away for the weekend. It basically cooks itself while we unpack our bags, sort through the mail, and get ready for Monday morning. “Don’t worry, it’s no trouble at all,” you blithely assure them. “Impromptu parties are always fun.” And you mean every word. You may think the recipe (such an officious-sounding word in a case like this) below is too minimalist; aside from salt and pepper, there are only three ingredients. So, depending on your mood and the provisions at hand, feel free to embellish. Crumble a lavish amount of crisp bacon on top or toss in some quick-braised pot greens, roasted tomatoes, or roughly chopped fresh herbs. To add sharpness and verve to the meal, you could follow the pasta with a salad of fennel, orange, and green olives. Or simply a bowl of clementines. Heat the olive oil in a medium-size heavy pot or skillet* over moderate heat until it goes a bit shimmery. Add the onions and stir them around with a wooden spatula to coat them with some oil. Then gently shove them into a heap, right in the center of the pot (they will steam—almost braise, really—in their juices and the oil). Cover the pot and reduce the heat to very low. A quick digression on the main ingredient: Don’t substitute Vidalias or other sweet onions for the plain-old yellow onions called for above. Sweet varieties get cloying when they cook down, and no amount of salt will push the dish back into balance. As far as chopping is concerned, use a heavy knife with a wide blade—and let it do most of the work for you. Don’t be tempted to use a food processor; you’ll wind up with a slushy mess instead of uniform pieces that will cook evenly. One last thing: Feel free to double the amount of onions you use and tuck half of them in the refrigerator for later in the week. They’re delicious on pizza or bruschetta, in an omelet, or tossed with braised pot greens. While the onions are working, get a large pot of salted water ready for the pasta and enjoy a glass of red wine. If you happen to have a crumbly hunk of Parmigiano-Reggiano sitting around, now’s the time to pull it out and let everyone have at it. Cook the onions for at least 30 to 40 minutes, until they are beyond pliant—you want them very soft and lush and pale golden. Give them a stir every so often to prevent them from sticking or coloring too much but keep them in their huddle. Add a little more oil if you think it wise. Now, some recipes will advise you to increase the heat and sauté the onions until they caramelize—that is, turn a dark amber and leave a rich, meaty-tasting glaze on the bottom of the pot. I’m not after that sort of jammy intensity here, but a very mellow roundness, so I don’t take them nearly that far. By the time the pasta is cooked and the plates are warmed, some thoughtful person will have opened another bottle of red and the table will be glowing in the candlelight. Drain the pasta and put it in your favorite serving bowl. Slather it with the onions, use two big spoons to distribute the savoriness, and don’t worry about the fact that what you are serving looks rather plain. It will be wonderful. * I’d avoid using cast-iron because of the black interior; it’s too difficult to see what the onions are doing. Posted: March 30th, 2011 under cooking, food, recipes, scratch supper. Jane, I love your blog, and this post . Simple, delicious recipes like this one are ideal for me right now, living in Paris, currently without a job, and cooking almost daily to save money. Not to mention I have 3 large yellow onions and spaghettini on hand. Can’t wait to try it tonight! I’m new to your blog, but have fallen in love with it. Reading your posts makes me feel like I’m sitting at your kitchen table while you cook. Such a warm, friendly, cozy feeling. What a nice treat on a cold, drizzly March morning! Wow–what a lovely compliment. I resisted writing a blog for ages, and then, of course, discovered it was great fun to make new friends and gather everyone around the same table…. So funny just now I was cooking some yellow onions down for a chicken liver pâté and remembered your puzzling instruction to keep them in a pile in the middle of the pan. So I tried it. It’s really miraculous. What are the physics? They make their own little oven? The bare space around them gives off more heat so they cook all around? Now that is valuable! How did you find that out, Jane? I’m no Harold McGee, but I think that when you keep the onions in a mass, the moisture that you are cooking out of them doesn’t evaporate as quickly as it does when you spread out the discrete little pieces of onion. The steam from the onions on the bottom softens the onions on the top. And because the heat is so low, I find the process easier to control. I can literally put those onions on the back burner while I concentrate on something else. I wish I could remember who, exactly, I picked the technique up from, but I keep drawing a blank; it’s going to be one of those things that pop into my head at 3 o’clock in the morning, I just know it. One thing I forgot to mention in the post (I might have to sneak in and amend matters) is that I often cook up more onions than I need for the pasta. They keep beautifully in the fridge and you can use them in other things during the week. Well, if you remember… Another good thing about that post is the advice to stick with good strong yellow onions for caramelizing. I had this discussion with a new farmer last summer — she was urging me to buy sweet onions for caramelizing, and I was definitely after her small yellow ones which I had already found out were the best for that purpose. I think I’ll send her a link to this excellent blog. We just ate these onions atop a barley-spelt-rice mixture from Trader Joe’s. (Somehow we had run out of spaghetti–drat!) Delicious, and so easy; I will have to restrain myself from serving this with welcome-wearing frequency. I really enjoy the way you write recipes and am so pleased that you are blogging!